One of the best known of all cultivars is the Dahlia ‘Bishop of Llandaff’, it is an attractive dark foliage cultivar with dark coloured, almost black, foliage and brilliant clear red flowers. 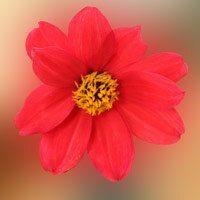 The red flowers are semi double and this os one Dahlia that has stood the test of time, being in cultivation for nearly 100 years. It is disease resistant and hardy, as well as being a stunning garden plant. Usually available for sale from May through to August. Dahlia ‘Bishop of Llandaff’ is a tough shrubby Dahlia that generally does not require staking. Best planted in a free draining soil, ‘Bishop of Llandaff’ will reach around 1m in height with a spread of around .5m. You could grow them in a large container or simply plant them in the garden border in a cottage garden, try to give it enough room to spread. A humus rich well drained soil is essential, and in Australia you can get away with leaving the tubers in the ground over winter, as long as the soil is a sandy well drained type, and you do get heavy frosts. Otherwise lift in late autumn and over winter in a cool dry shed.